Ozzie Can You Hear Me? Summer is now in full swing. Schools are in recess and the heat and humidity are turned on high! Ozzie has retreated to the AC and is quite content. Well except for the medication he is taking for his ear infection. He is on Prednisone in minimal doses and it is suppose to alleviate the swelling in his inner ear, which is just about closed shut with a yeast infection. Maybe all those times I thought he was ignoring me he really was not able to hear me very well?! The problems with Prednisone is that the side effects are not too pleasant at least in Ozzie's case. First off it increases hunger ( oh great there goes the diet this week). Secondly he is thirsty as a bulldog in the desert. Another result of that is he has to pee more often. I found this out when I discovered the carpet in the family room was wet the other day as I stepped onto it in bare feet! Then when we left him with Grandpa he peed on the kitchen floor. Not good, especially for my Oriental rug and wood floor! We are almost done with the meds so hopefully its doing its job other than making Oz a peeing machine! Yes with summer comes heat, humidity and yeast infections! Day 4 of gloomy rain and flash floods in the area. Ozzie finds it a bit depressing and so do I. Though the weekend forecast in the Tri-state area is suppose to be mostly sunny and in the low 80's so we are waiting patiently. I didn't get to mention the other day about Oz's vet Dr Tracey, suggestion about how to handle the Ozzie attacking Will situation. She thinks when Will comes to the door while we are home that Ozzie feels he has to defend his family and turf. She suggested that William announce himself when he arrives and has a "10,000 dollar treat" on him to offer to the Oz. Practicing this kind of entrance will have Ozzie equate Will's arrival as a good thing. We gave it a try yesterday. Will rang the door bell and Ozzie got excited and I told him " Will is here, lets go see him!" I gave Will a pork skin roll treat stick (something he rarely gets) to have in hand upon his initial entrance. Wow it worked! Ozzie was more interested in the treat than acting aggressive. I will have to make sure that William is well supplied with pork rolls. Not good for would-be burglars to be aware of! We'll see if we can continue this gracious greeting going forward! I made the Pupsicle frozen yogurt treats for Ozzie. I must admit they were pretty easy to whip up and the leftover yogurt mix I drank as a smoothie! Oz really enjoyed them (there isn't much that he doesn't enjoy) and they will be our new Summer treat. Here is wishing you all a wonderful first weekend of Summer! Yesterday was Ozzie's annual check up. It was the usual cajoling to get him into the car. I had to start off 30 minutes earlier than I would normally need in order to get him there on time. It is like he has a 6Th sense about going to the vets! As we waited inside the examining room he plastered himself to the tile floor in the corner hoping not to be seen. The vet technician came in to get Oz in order to draw some blood samples out of him. He went willingly. When they returned she said that she had a hard time getting blood from him since the usual spot they take it from, the neck, was to hard to penetrate with all that fat. 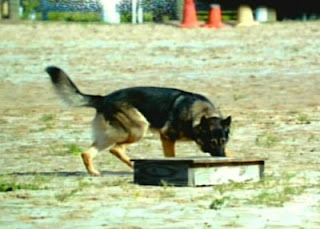 Then she tried his back leg but that had too much muscle so finally she used the front leg which they don't normally do. Dr. Tracey was happy to see Oz but I don't think he was too thrilled. It ended up he had a yeast infection in both ears with a mild case of conjunctivitis in his right eye, which is perennially red most of the time! Of course his weight, a hefty 80 pounds was discussed. Dr Tracey suggested a new diet regime. I have heard of it before, its Hills Prescription Diet Therapeutic Weight Reduction. It's prepackaged food and treats that you feed Fido over a 4 week period and they guarantee your pooch will lose weight. We are willing to give it a try at this point, there are not too many options. Though Dr Tracey has conceded that it just may not be in Ozzie's DNA to be thin! As we waited in the outer office for the meds and food, Ozzie walked behind the desk with all the staff so he could keep a watchful eye on what was going on. They all love him there because he is such the character. One lady who was waiting with her kitty cat came up to Ozzie to pet him and asked if he was a Shar-pei. When I told her he was a Bulldog she replied that she "Gets the "wrinkled" dogs confused." I told her that Shar-pei's are a little taller! Wish us luck, today is day one on the diet which we have to ease into with mixing the old and new food together as not to upset his tummy. We have to return in 10 days for a recheck so we can see if Ozzie has become the "biggest loser"! I am a little late in the day for posting on the blog but there were technical difficulties to attend to this morning. I encountered an awful virus on my laptop over the weekend and had to take it to our friend Glen to have the nasty invader eradicated. Glen had to run several anti-virus programs so I ended up leaving it there with him. It may take some doing to clean it up! Any how we had a nice weekend. On Father's Day, Ozzie presented his Pop with a customized mouse pad with a picture of guess who on it. Pop couldn't be happier if you gave him season tickets to the Yankees ( I think?). Auntie Viv and Will came over to have a barbecue with us and Ozzie was probably the recipient of some barbecue goodies from Auntie who can't resist that face! Ozzie did try to go after Will when he walked in the house, again, and his Pop had to physically hold him back. I can't wait to talk to the veterinarian tomorrow and see if we can put our heads together to get to the bottom of this troubling behavior! Once Will is in the room he calms down and has no more issues with him. Very odd indeed. Ozzie was an attentive host for the rest of the evening and saw everyone to the door as they left making sure there wasn't anymore treats to be had. Speaking of treats, I found an interesting summer treat recipe online for man's best friend and I'll tell you I wouldn't mind it for myself. They are yogurt/fruit ice cubes and seem easy enough to whip up. I think I will give it a whirl this week for Ozzie and let you know if he gives it a paws up or down. Here you go and let me know if anyone out there ends up making it for their doggies (or themselves!). Ingredients: two mashed bananas, one cup strawberries (fresh or frozen), one cup organic apple juice, and two cups yogurt (plain or vanilla). Instructions: Puree all ingredients in a blender, pour into ice cube trays or small plastic cups, freeze for one hour or more as needed, and thaw just so slightly before serving. 6:30 AM: Awaken to the smell of Pop making lunch to "brown bag it" at work. Run downstairs to look pathetic enough to score a piece of cheese before Pop puts away lunch stuff. 6:45 AM: Wait patiently "on deck" in the living room for Mom to come down and make her coffee. This signals that she is almost ready to prepare my breakfast. 6:55 AM: Kibble is in the bowl. I eat as fast as I can making loud noshing noises. 7:05 AM: Say good-bye to Pop who is on his way out the door to go to work. 7:06 AM: Climb onto the couch for my morning nap. This is quite the exhausting schedule as one might imagine! The weekends are a little different but the results are the same! Before we go I want to mention to you about a fellow Bulldog who has been going through some hard times as of late. His name is Diesel and he was rescued from an abusive situation by a wonderful woman named Madelyn. Though now he has a new forever home he is suffering from kidney failure. He is currently in Delaware Valley Veterinary Hospital under going treatment. Please stop by his facebook page and leave a post of hope and encouragement. She is also trying to raise money for his treatment so there is opportunity for you to donate through his FB page as well. As we know veterinary care like this is extremely costly! Every time I hear stories of animal abuse it sickens me to think how cruel and horrible people can be. Then when you read about folks like Madelyn you realize there is goodness in this world and hopefully the folks like Madelyn out number the bad ones! Happy Father's Day to all you wonderful daddies out there, fur dads and human dads alike! Ozzie received a package the other day. The UPS man was greeted by an anxious Oz at the door. The man in brown inquired if he was a bulldog. As I nodded yes he inquired "What were they originally bred for?" "They were bred to bait bulls in a ring. It was a sporting event back in the 1800's" I told him. The UPS man looked at Ozzie with a questionable expression. "Well I think the original bulldog was a little more leaner and muscular!" Ozzie looked at me as if to say "What? You don't call this body muscular?" I brought in the package and opened it up. In it was his tank top that I ordered from Cool Blue Dog. They make cool clothes for hard to fit breeds like bullies, pugs and Frenchies. You know the barrel chested canines, that usually are left out in the cold when it comes to apparel. They are touting their Spring collection which includes tank tops with some lets say "breed appropriate" slogans. As I unwrapped the tank I looked at it and thought that it may not fit Ozzie. I emailed the owner of Cool Blue, Angela and she told me that they are very stretchable, so I gave it a try. Indeed they must have some Lycra in them because I was able to get it over Ozzie's girth! Though it may accentuate his love handles, I think as our quest to lose weight continues it will look better on him in time! 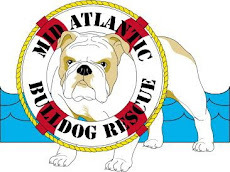 I can't wait until the next Bulldog Beach Bash down the Jersey shore in Belmar! (Quite the alliteration!) It's in the beginning of October and the Oz should be svelte by then! He will definitely be the coolest bullie on the beach sporting his tank top! 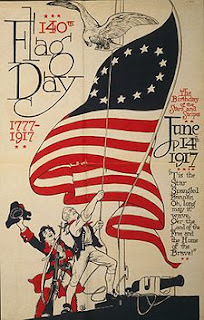 Just a reminder to all that June 14th is Flag Day. Back in 1777 on June 14th the Continental Congress approved the first American flag. In 1818, after 5 more states joined the Union, Congress passed legislation fixing the number of stripes at 13 and requiring that the number of stars equal the number of states. Often referred to as the "Stars and Stripes" or "Old Glory" it represents our history and those who fought to keep our nation a democracy, the land of the free, home of the brave. We recently had to retire our flag that hung outside of our house. It had become tattered and torn from numerous storms. I had my dad bring it down to the American Legion hall where they respectfully and according to flag regulations, destroy the flag. There are many more rules in respects to parades and government displays. I am probably guilty of not complying to some of these regulations. I promise to do better with the next flag we get. So if you have a flag display it proudly. If you don't, go out there and get one today! I must admit it was a slow weekend. Which is not a bad thing. Ozzie mostly worked on his foot long bully stick when he wasn't napping! The biggest jolt of excitement for Ozzie was when my son Will came over for a visit on Saturday. 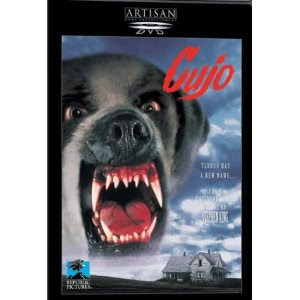 His entrance into the house prompted a reaction that of Cujo from the Oz! I still have no sound reason why the usually benign bulldog goes crazy like a guard dog at used car lot every time Will walks in the door. Maybe in his life before us some tall, skinny guy kicked him or stole his kibble? I will talk to the vet about this when he goes for his check up next week. Speaking of which, I better make a list of all the issues I need to discuss with Dr Tracey. His latest skin eruption is in the upper corner of his left eye which usually never has any irritation. I think the warmer weather brings out some allergens that causes skin problems for many dogs. Of course we will have the talk about his weight. There is no getting around that! Though he dropped 2 pounds from the winter months! I just wanted to mention a nice story that was in the news this weekend. Especially with all the negative news like Congressman Anthony Weiner's internet antics and the grueling Casey Anthony trial that we have been bombarded with of late. 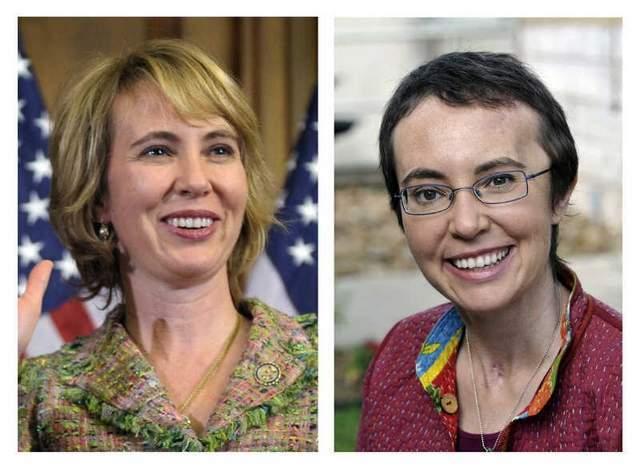 The first pictures of Congresswoman Gabrielle Gifford were posted on her Facebook page since her tragic attack back in January. They were taken last month and show her smiling. Her hair is short and darker, and you can see the left side of her head has a depression in it from the injury. Even with all of this her smile radiates hope and triumph over a difficult situation! She is certainly resilient and wish we her the best in her continuing recovery. 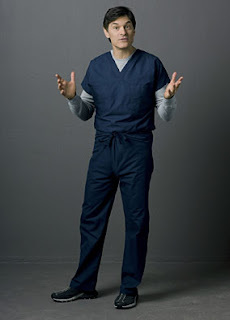 I was watching Dr Oz yesterday and he had a segment of his show devoted to canine health. 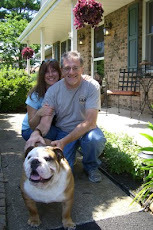 They featured a bulldog, who's name I have forgotten but a nice looking bully boy, I call him Bubba for now. They filmed Bubba at his home where he had a place at the family dinner table (yes his own plate setting) and ate pretty much what everyone in the family consumed. At night when his young master had a bowl of ice-cream so did he! I loved when they showed him playing "fetch" in the back yard. The typical bulldog, he watched the kid fetch the ball! They brought the bulldog on stage with Dr Oz who weighed our allegedly chunky pooch. He got on the scale and low and behold he weighed 60 pounds! Dr Oz went on to tell the owner how they have to follow a new diet (using their sponsors dog food Pedigree, of course!) and could they do it for Bubba's endangered health!? The owner nodded enthusiastically and off the stage they went. I would like to see the follow up visit with Bubba and his family. Bad habits like that are hard to break and somehow I think he will continue to get his nightly ice-cream! Now let me tell you that 60 pounds is a normal weight for a male bulldog. I could only wish that Ozzie weighed that much but then again he is a big boned boy! I think bulldogs get a bad rep for their portly figures. The Oz weighs 19 pounds more than the bulldog on the show and he would probably be the better choice for that segment! 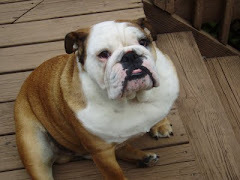 Maybe we should write to Dr Oz and see if would be interested in a real chubby bulldog who shares the same name?! I have to go now and feed Ozzie his breakfast. I could imagine that he is now sitting at the table waiting for his Eggs Benedict but in reality he is sleeping on the couch until I serve him his weight management style kibble in his bowl! I can't help but be fascinated and follow tirelessly the Casey Anthony trial. I guess the whole country is checking out the infamous Casey who is accused of callously murdering her daughter and for a month after wards was partying and living the good life until she finally confessed to her mother that Caylee was "missing'! Yesterday they brought to the witness stand the canine officer Deputy Jason Forgey who's German Sheppard, Gariss, the cadaver dog alerted police to the smell in the Anthony's backyard and the trunk of Casey's car. The defense attorney, Jose Baez, tried to discredit the dog, saying he was trying to please his master first rather than finding the scent he was trained for. The defense is just getting desperate in my opinion. Cadaver dogs are trained to ignore live human scent and only alert on human remains. They will ignore all other smells like those of dead animals , rotting food etc. They can even detect bodies under water! Their accuracy rate is nearly 100%. I trust dogs more than people in all accounts. I know that Ozzie can smell a piece of cheese three rooms away, in a deep sleep no less! I will be watching the trial again today to see how the defense continues to disprove the findings of the police's canine force. I think in the end they will fail because as any dog owner knows that their pooch was born to sniff! Another Monday rears its ugly head and the Oz is not too excited about it. Over the weekend we went out on Sunday for brunch with friends and left Ozzie home alone. Needless to say he was not happy about that either. I tried to make all this up to him by giving him his favorite treat, a bully stick. It didn't evoke the usually joyful response. Oh well I guess he will get back into the swing of things after he takes his morning power nap. Monday, Mondays.....any rate I will leave you with a quote from Mark Twain who by the way had a lot of good things to say about dogs! This one happens to be one of my favorite quotes since I believe it is probably true. Though as we well know, all dogs go to heaven! 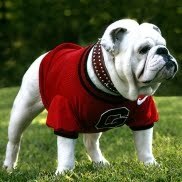 I read on the internet the other day that the University of Georgia is still waiting for its permanent replacement of their bulldog mascot, Uga. A new Uga heir has not been produced since the death of Uga VII this past February. Sonny Seiler who's family has breed and provided the Uga's has reviewed a couple of litters and has not found one that fits the bill. At the moment they have Russ the bulldog who has been a admirable stand in doing the job. 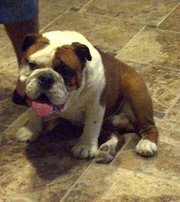 Sonny is currently waiting for a new litter sired by Russ and a white bulldog female that is not from the Uga bloodline. She is due in June. In the meanwhile take a look at the progression of Uga's since the 1950's until today. 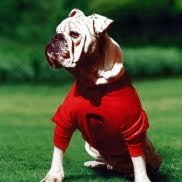 The original Uga in the picture appears to be a strong, athletic dog up to the task of mascot for a football team. The last Uga in comparison is a chunky, lumbering couch potato, much like the Oz! Maybe the breed has evolved too much away from what the intent was originally?! Though today's bullies are a lot cuter than their ancestors, I must admit! Ozzie has been down in the dumps lately. He truly has become one with the couch! I wish there was something that would light a fire in him. He hates to go for a walk and dislikes the dog park. He does however have a highlight to his day. It is sitting on the front porch in the evening with his Pop and greeting all those who pass by. At least now with the Summer approaching it is just about a nightly event. Maybe we can enroll him in day camp for dogs? Or I was thinking about the plastic kiddie pool but every time we take out the garden hose, Ozzie runs the other way! Probably if you ask Ozzie he would say, "I am just fine chillin' if you don't mind!"